Buy New and Used Buick and GMC Vehicles at Our Merrillville, IN, Dealership! 1Please print this page to take advantage Simple@Schepel selected inventory discount. Not compatible with GM discounted sales (GM supplier, GM Employee, Costco) 2This STANDALONE GM Overage Offer can not be combined with any other programs or incentives, except for redeemable GM Card points (which vary depending on which type of GM Card the customer has). only vehicles which qualify for GM "overage" specifications are eligible for this percentage off offer. 3This is a owner competitive program. Must currently own or lease a 2005 or newer non GM passenger car or truck owners/lessees. Not compatible with incentivized lease. GM Card only. 4This STANDALONE GM Financial Special Finance APR cannot be combined with any other programs or incentives, except for redeemable GM Card points (which vary depending on which type of GM Card the customer has). MUST finance thru GM Financial with approved credit. 1This STANDALONE GM Overage Offer can not be combined with any other programs or incentives, except for redeemable GM Card points (which vary depending on which type of GM Card the customer has). only vehicles which qualify for GM "overage" specifications are eligible for this percentage off offer. 2This is a owner competitive program. Must currently own or lease a 2005 or newer non GM passenger car or truck owners/lessees. Not compatible with incentivized lease. GM Card only. 3This STANDALONE GM Financial Special Finance APR cannot be combined with any other programs or incentives, except for redeemable GM Card points (which vary depending on which type of GM Card the customer has). MUST finance thru GM Financial with approved credit. 1Please print this page to take advantage Simple@Schepel selected inventory discount. Not compatible with GM discounted sales (GM supplier, GM Employee) 2This STANDALONE GM Overage Offer can not be combined with any other programs or incentives, except for redeemable GM Card points (which vary depending on which type of GM Card the customer has). only vehicles which qualify for GM "overage" specifications are eligible for this percentage off offer. 3This is a owner competitive program. Must currently own or lease a 2005 or newer non GM passenger car or truck owners/lessees. Not compatible with incentivized lease. GM Card only. 4This STANDALONE GM Financial Special Finance APR cannot be combined with any other programs or incentives, except for redeemable GM Card points (which vary depending on which type of GM Card the customer has). MUST finance thru GM Financial with approved credit. The new GMC Terrain, offered at our Merrillville dealership, is a perfect blend of remarkable styling, utility, and efficiency. Schepel Buick GMC invites you in Merrillville, to discover the fabulous features of this fantastic vehicle. Our inventory of new vehicles is where you can find exactly what you are looking for. 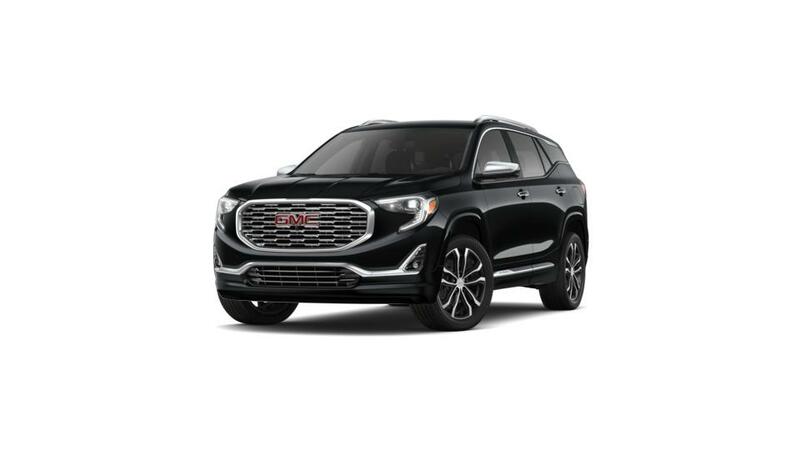 The new GMC Terrain, available at our Merrillville dealership, offers a remarkably quiet ride, thanks to its triple door seals and acoustic-laminated windshield. Safety has not been compromised as this SUV comes with innovative safety features to keep you and your passengers secure during your commute. The new GMC Terrain, offered at our Merrillville dealership, is loaded with tons of such cool features which make your ride more enjoyable. Schepel Buick GMC’s staff also takes care of financing options and make sure the process is completely stress-free. Call us at (219) 472-1449 and have a word with our experts, or schedule an appointment to meet them in person. Hurry! Visit us to test drive the new GMC Terrain in Merrillville today. Welcome to Schepel Buick GMC, your local Merrillville GMC Buick dealership. We've also served many customers who were looking for a nearby Chicago Buick GMC dealership. Browse through our new inventory of Buick and GMC cars, trucks and SUVs. By using the filter options to sort through the search results, you'll be sure to find a vehicle that will your suit your lifestyle and budget. Stopping by from Merrillville or visiting from Chicago? We have a wide selection of certified used Buick and GMC vehicles ready for you to test drive. We have some reliable used vehicles starting as low as $9000 and other vehicles with mileage as low as 5 MPG. You can't beat the great deals at Schepel Buick GMC! When you're hunting for the perfect new or new-to you car, truck, SUV or van, there's absolutely no reason to compromise. That's why we can't wait to work with you at our Buick dealership near Crown Point, IN, to find you the perfect new or pre-owned vehicle. We maintain an expansive selection of both Buick and GMC models, each with its own litany of benefits. Need a truck for your business that won't quit? Check out the new GMC Sierra, a pickup with the strength to tackle tough jobs. Need a budget-friendly SUV in which to transport your family around Indiana? The GMC Acadia can handle a full crowd. Or maybe you'd prefer a vehicle that's a been more refined -- we have those, too! Take a look at the new Buick Enclave for a host of tech features or a pre-owned Buick LaCrosse for a stylish sedan you'll enjoy for years to come. Visit our GMC and Buick dealership near Schererville, IN, today, and see what we can do for you! I traded in a vehicle for a new one and everyone was outstanding and helpful throughout my visit. The visit to your dealership was very satisfying. Rick, our salesman, made the experience stress free and enjoyable. They really treat you like family! I worked with Calvin this time he was awesome! They have an amazing crew. Device good and sales Tim Tedesco was pleasant to deal with. Salesman was great, was told when I picked up car, it would be ready to go with full tank of gas. Had to ask about gas,& wait on porter to fill tank. Fast and easy in and out. Car was ready when you said it would be. Friendly service person. Every one was very friendly. Atmosphere was very pleasant.